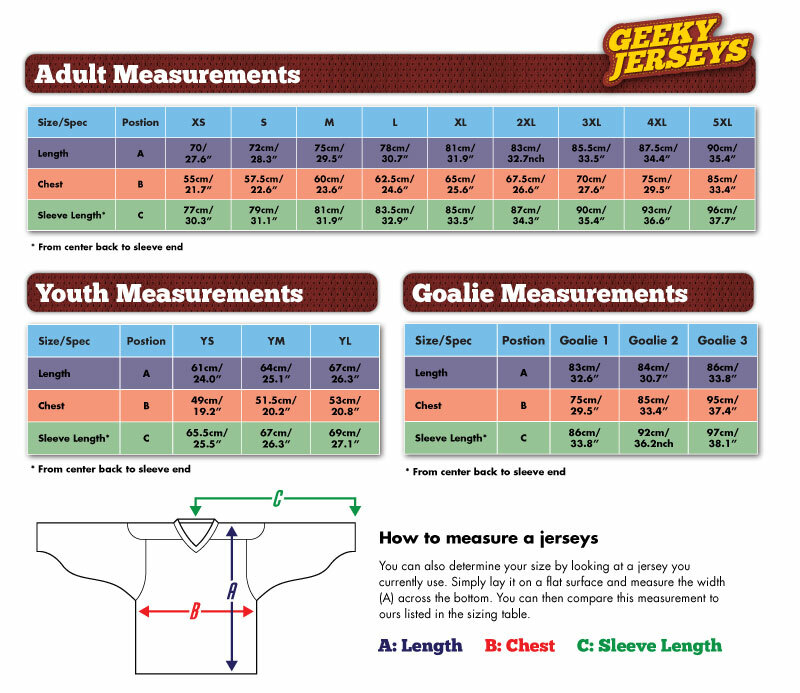 You may not always think “sports fan” and “geek” in the same sentence, but Geeky Jerseys proves that sometimes it’s OK to cross the streams with their pop-culture-inspired hockey jerseys. Each jersey runs for a limited time, so if you see something you like, you should get it while it’s available. I have an earlier version of the TARDIS jersey, which is now available in its 3.0 edition through December 16. The jersey looks, feels, and wears just like you expect a hockey jersey to look, feel, and wear. That means the sleeves are a bit long, particularly on a short-armed girl like me, but not so long that I feel uncomfortable wearing it. (As you can see in the pictures, I still have hands!) Their size chart runs true to its measurements, ranging from an XS with a 21.7″ wide chest to a 5XL, which is 33.4″:across the chest. I chose an XS, which fits me just right, and I’m about a size 8, so if you’re a very small woman, even the smallest size might seem big. But they’re incredibly comfortable, and ever since the weather cooled off, I can’t stop wearing mine–I even took it out for a trip around the ice rink. Having watched the site for a while, I can attest that there’s a jersey for every fan, from the popular Boba Fett and Game of Thrones jerseys to zombies and Masters of the Universe . Their Voltron design impressed the show’s creators so much that they now sell those jerseys exclusively from the Voltron website. And if you want to get in on the design previews and cheering, you can follow them on Facebook or Twitter. If you’re out holiday shopping, the current selections include TARDIS 3.0, Captain 2.0, Hill Valley Gigawatts, Dark Side, and Spartan, but note that they won’t shop up on your doorstep by December 25. (But hey, it’s never too early to start Valentine’s shopping!) Of course, if you’re not sure what to pick or just want to let your favorite geek wait for the perfect jersey, they also offer gift certificates. Geeky Jerseys sent me the pictured jersey for review.